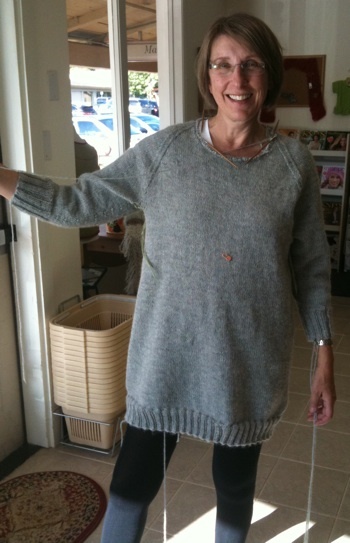 Here is Linda, modeling her Sweater-Dress! We were giddy when she was trying it on and loved it! Wow, is all I have to say – quite a validating experience to see you all “getting it”. Aren't the sleeves a lovely length! 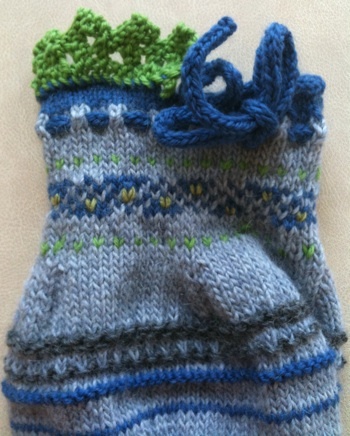 Now, check out Susan’s finished Sweater Sampler – such engaging colors! Look closely at the extra color she added with the Duplicate Stitch in the two color knitted section! Thanks so much for sharing these photos. I’m told that in New York City Linda’s sleeves would be called “bracelet length”. 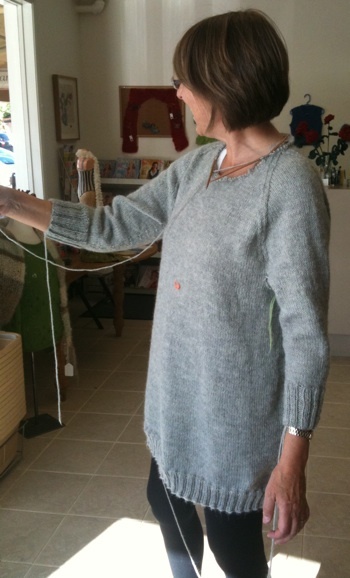 I was told that as I modeled a sweater w/same length sleeves w/the explanation that I was running short of yarn. But nay,nay I was told that length is a “Design Feature” and on Linda’s sweater it certainly is!!. Also marvel at all the knitting to get that stunning length & a terrific neckline. And Susan deserves an A++ for her Sampler – sure looks perfect from here!!! And her colors give it a “fishy” underwater glow! You are doing a superb job w/my SW!!! !